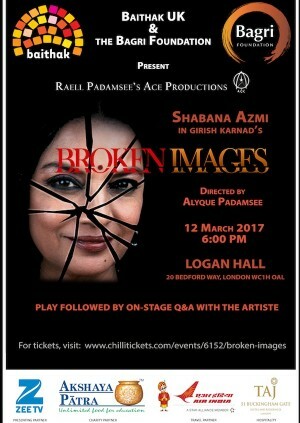 To mark International Women’s Day, BAITHAK UK and the Bagri Foundation are delighted to present, for the first time in the UK, the play Broken Images featuring the legendary Shabana Azmi. The English language play is written by Girish Karnad and directed by Alyque Padamsee. Two sisters, one an intellectually brilliant paraplegic, the other a plodding writer, live under the same roof, dependent on each other but inhabiting different emotional and linguistic worlds. The arrangement is fraught not only because the sisters are involved with the same man, but because they continually modify the image they have of each other and the world around. The twenty first century is an era of electronic images. From every corner of our lives, images fling themselves at us, arguing, accusing, wheedling, until the every essence of our private lives seem threatened. But suppose the deadliest of these images were of one’s own shattered self? Shabana Azmi plays both the sisters on stage and their many images, as they morph into one another, in one of the most challenging roles of her career. BAITHAK UK celebrates the best of South Asian arts legacy, creates a platform for dialogue and debate, nurtures new work and develops new audiences. THE BAGRI FOUNDATION is a UK charity whose principal aim includes the advancement of literacy, education and the arts, as well as the appreciation and understanding of Asian cultures. Logan Hall does not have wheelchair access facilities. Ticket holders will be allotted seat numbers on arrival at the venue on the event day. Please carry a print out of your booking confirmation.